The Marley collection, crafted from black walnut, is a masterpiece of quintessential accessories by the lifestyle brand of reggae legend Bob Marley. Marley Natural has engineered an ideal set of necessities for the image-conscious user with a refined taste for style and luxury. With a Jamaican flare, each individual piece is crafted to perfection – fusing form and function to produce the most beautiful, convenient pieces available to the recreational smoker. The collection is made from sustainably-grown American Black Walnut wood that are accented by heat resistant hand-blown glass – ensuring durability, convenient maintenance, and a comfortable hand-held feel. 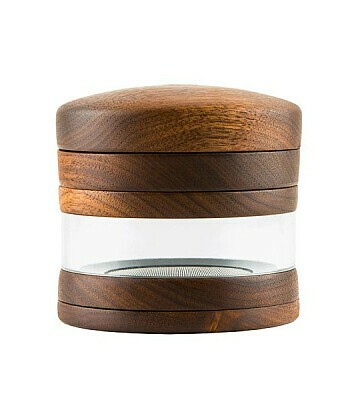 Remove the lid from the Marley Natural Wood Grinder and apply your material to the teeth. Replace the lid, press down and begin to rotate until your material is fully ground. Unscrew middle section to access your freshly ground materials.